News » Warping it up! CPH ZOO 3rd April 2011, a set on Flickr. My wife and I went for a little trip to the ZOO in Copenhagen, and we took a few photos! 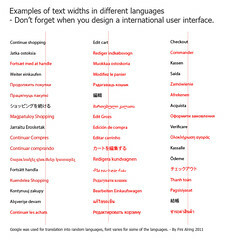 Don’t forget to consider the size of text in various languages when you design a international user interface. I have been busy in the WordPress sphere doing loads of blogs and sites for friends and customers. As well as playing around with my community site DroidBuilders.net. I am also in the early start of making a few plugins, and I can’t wait to start using and releasing beta versions on this blog. So all in all; fear not, I am still a WordPress fanatic! See you soon! Scary news everybody, our universe might be a 2D hologram.. Twist your minds around that! … For many months, the GEO600 team-members had been scratching their heads over inexplicable noise that is plaguing their giant detector. Then, out of the blue, a researcher approached them with an explanation. In fact, he had even predicted the noise before he knew they were detecting it. According to Craig Hogan, a physicist at the Fermilab particle physics lab in Batavia, Illinois, GEO600 has stumbled upon the fundamental limit of space-time – the point where space-time stops behaving like the smooth continuum Einstein described and instead dissolves into “grains”, just as a newspaper photograph dissolves into dots as you zoom in. “It looks like GEO600 is being buffeted by the microscopic quantum convulsions of space-time,” says Hogan.